“Association copies,” books once owned by their authors or other well-known individuals, have long been sought after by collectors. An outstanding private collection of books associated with famous judges and lawyers is now on display at the Lillian Goldman Law Library. 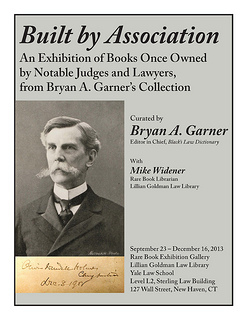 “Built by Association: Books Once Owned by Notable Judges and Lawyers,” features books from the collection of Bryan A. Garner, the world’s leading legal lexicographer. They include books inscribed by John Jay, the first chief justice of the U.S. Supreme Court, and Clarence Darrow, the most famous trial lawyer in American history. Other notable figures include Supreme Court Justices Oliver Wendell Holmes, Jr. and Benjamin Cardozo, and Lindley Murray, a lawyer best known as “the father of English grammar.” Three of the authors taught at Yale Law School: Supreme Court Justice William O. Douglas, Judge Jerome Frank, and the iconoclastic Professor Fred Rodell. Bryan A. Garner has been editor in chief of Black’s Law Dictionary since 1996. He has authored many other standard reference works in legal lexicography and legal writing, including Garner’s Dictionary of Legal Usage (3rd ed. 2011), The Elements of Legal Style (2nd ed. 2002), and The Redbook: A Manual on Legal Style (3rd ed. 2013). He is the co-author with U.S. Supreme Court Justice Antonin Scalia of Making Your Case: The Art of Persuading Judges (2008) and Reading Law: The Interpretation of Legal Texts (2012). Garner is also the author of Garner’s Modern American Usage (3rd ed. 2009), published by Oxford University Press. Garner is the owner of LawProse, which conducts seminars in legal writing around the world. He is also Distinguished Research Professor of Law at Southern Methodist University. His personal book collection has over 35,000 volumes. Garner curated the exhibit, with assistance from Mike Widener, Rare Book Librarian. The exhibit is open to the public, 9am-10pm daily, September 23 - December 18, 2013 in the Lillian Goldman Law Library, Yale Law School. On Friday (Sept. 13), the library of the Stephan Kuttner Institute of Medieval Canon Law arrived at its new home in the Lillian Goldman Law Library. This weekend it is being installed in the Law Library’s Upper East Side, next to the fish tank. This outstanding collection of research materials draws scholars from around the world. It contains over 2,000 monographs and 15,000 offprints from the private library of Stephan Kuttner, the Institute’s founder and one of the 20th century’s most influential scholars of medieval law, as well as microfilms of approximately 670 medieval manuscripts. This is the second time the Institute and its collection have resided at Yale. Kuttner founded the Institute of Medieval Canon Law in 1955 at Catholic University of America. In 1964 Kuttner and the Institute moved to Yale, and its library was housed in the Sterling Memorial Library. In 1970 the Institute moved to the Robbins Collection, University of California-Berkeley. When Kuttner died in 1996, the Institute was renamed the Stephan Kuttner Institute of Medieval Canon Law in honor of its late founder, and it moved to its most recent home at the University of Munich. The Institute’s library will remain in the Lillian Goldman Law Library for the next 25 years, with an option to renew the arrangement. The materials will not circulate but must be used in the Law Library. Plans are being made to add records for the Institute’s library to the Law Library’s online catalog, MORRIS. In the meantime, researchers can use the library’s existing online catalog for monographs and microfilms, and a database for the offprint collection. Thanks to the Kuttner Institute’s president, Professor Peter Landau of the University of Munich, and its Secretary Anders Winroth, the Forst Family Professor of History here at Yale University, for making this move possible. thanks to all my Law Library colleagues who helped with the move: Law Library Director Blair Kauffman, Teresa Miguel-Stearns, Fred Shapiro, Julian Aiken, Cesar Zapata, Susan Karpuk, Ryan Greenwood, Ben Bernard, Antonio Malabag, Liliane McClenning, and Shana Jackson. 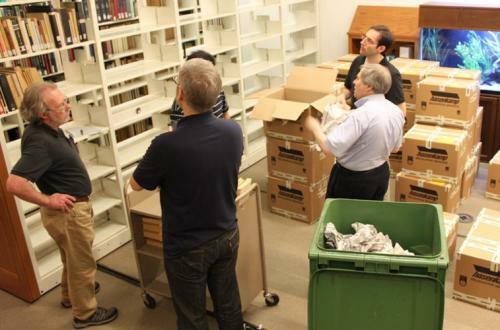 Professor Anders Winroth helps unpack the library of the Stephan Kuttner Institute of Medieval Canon Law. Welcome to our 2013-14 Rare Book Fellow! 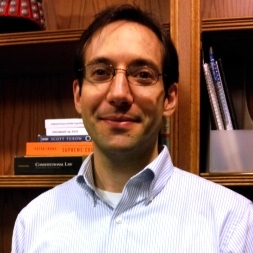 The Lillian Goldman Law Library is delighted to welcome Ryan Greenwood as its first Yale Law Library Rare Book Fellow. Ryan has a Master’s in Library & Information Science from Rutgers University, and a Ph.D. and M.A. in Medieval Studies from the University of Toronto. He has two articles accepted for publication: “Just War and Crusade” (with Frederick H. Russell), forthcoming in The Cambridge History of Medieval Canon Law (2013), and “War and Sovereignty in Medieval Roman Law,” forthcoming in Law and History Review. He was chosen as the 2013-2014 Rare Book Fellow from a highly competitive pool of close to a hundred applicants. The Yale Law Library Rare Book Fellowship is designed to train the next generation of rare law book librarians. For the next nine months, Ryan will be immersed in all aspects of special collections librarianship in a research law library, including collection development, reference, cataloging, and preservation. He will also spend time working in the Yale University Library’s Manuscripts & Archives, and in the Beinecke Rare Book & Manuscript Library. The Yale Law Library Rare Fellowship is supported in part by a contribution from the Beinecke Rare Book & Manuscript Library. Selection for the 2014-2015 Rare Book Fellow will take place in Spring 2014. Stay tuned for the announcement. Image: Consultation pour une jeune fille condamnée à être brûlée vive (Paris: André-Charles Cailleau, 1786).